I am yet to meet anyone who hates music. Music must be one of the most universally loved things, which everyone from young to old, across cultures and continents, enjoy. Some say it is the highest form of art. Others consider it as the universal language that truly transcends cultural barriers. In this blog, we look at a few important questions (and bust a few myths) from the point of view of parents who have young children. 1. Is listening to a specific type of music beneficial to child’s cognitive development? 3. Are children with higher-order music skills born or made? There has been this longstanding belief that if your child listens to certain types of music, then he/she would turn out to be smarter. I have met many Indian parents who believe that if their child listens to Hindustani or Carnatic music every day, they will somehow turn out be very smart in their life. Similarly, in Western Europe and the USA, there has been this persistent and popular myth about the music composed by the great classical composer Wolfgang Amadeus Mozart. One of the reasons for the enduring popularity of this myth is that Mozart himself was a child prodigy. Mozart apparently was proficient on keyboard and violin by the age of 5. Many parents would love to raise a child prodigy and indeed hope that their child is one. This vulnerability of parents has been exploited by clever marketers who have made claims that listening to Mozart would make children smarter. But research has confirmed that listening to Mozart does NOT make your child clever but can result in a few short-term cognitive benefits. In fact, listening to many different types of music (including pop music) has been shown to have a temporary positive effect on a few things like spatial intelligence but has no lasting impact on the IQ or general intelligence in the long term. Researchers have concluded that the most probable reason for the temporary boost in certain aspects of your IQ (like spatial intelligence) is attributable to ‘arousal and mood factors’. What this simply means is that these temporary gains happen because of the positive feelings created in your mind due to listening to the music that you enjoy. But there have been no documented long-term benefits on the IQ of a person due to exposure to any one type of music. What about Indian Classical Music? As part of the research for this blog, we tried to unearth quality scientific publications that study the effect of listening to Indian classical music (Hindustani or Carnatic) on IQ or Cognitive development. But we could not find such research publications. Therefore, at this juncture, till proven otherwise, we would say that listening to Indian classical music too has no lasting benefits on a child’s IQ. Are there other benefits of listening to Music? It should be noted here that while there are no proven long-term benefits of listening to music with regards to the cognitive development of the child, there are might be other benefits of listening to music. Listening to music has been used as a technique in music therapy to deal with problems ranging from depression, anxiety to ADHD and is being explored as a solution to problems such as blood pressure, strokes, dementia, amnesia etc. While there is still some debate on the quality of research and the soundness of these claims especially in dealing with serious psychiatric disorders, there is hardly any doubt about that positive effects of listening to music for non-psychiatric conditions. Say No to only Listening! Get your child to Learn and Participate instead! So where does this leave us? Besides the enjoyment and perhaps a few minor short-term benefits, are there no tangible benefits of learning music for children? Well, the answer to these questions is that: While there may NOT be great benefits of listening to music from a cognitive development point of view, there are immense benefits to be gained from learning and actively participating in music sessions or performances! In other words, music education is beneficial for your children. What are the benefits of Music Education in Child Development? There is a huge body of research that indicates that learning music and active participation in it, has huge positive effects on child development. Here is a small subset of the documented benefits of music education. A 2002 study of 4-5-year-old children found that music correlates significantly with enhanced phonological awareness and reading development. Similarly, studies have found that music does enhance listening skills and even linguistic organization of the brain. Music has also been found to positively impact vocabulary and nonverbal reasoning. Participation of students and children in music lessons has been positively correlated with better academic results. Other research studies have found a link between music and verbal memory (both working and long-term). Musical training has been shown to alter brain networks resulting in many positive changes including improved fine motor skills. Even spatial intelligence, an important component of general intelligence and IQ, has been shown to increase due to exposure to music. Music has been shown to impact the ability to concentrate positively. (It should be noted that with regards to concentration, there is a lot of discussions and even some controversy). Creativity has been shown to be enhanced due to music. Music therapy is being explored actively to help children diagnosed with problems like ADHD and Autism. Even studies that are critical of music therapy note that music does have mood alleviating features to combat problems related to anxiety and depression and even help in better functioning such as maintaining relationships and jobs. Indian classical music is a deep and fascinating area. Active learning and participation in learning this form of music will surely benefit the child in many aspects, as listed above. Those among us who have learnt music in our childhood will vouch for its benefits including creating a sense of discipline and rigour, hand-body-mind coordination, coordination between participants, attention to detail, constant endeavour to learn and improve, reduction in public performance related anxieties etc. Why do Music Education and Active Participation have so many benefits? Why is it that listening to music has seemingly very few benefits but active participation has so many? Well, to put it very simply, “no pain, no gain”. Do we learn to play cricket and develop gross motor skills by simply watching it on TV? Do we accrue the benefits of a great and balanced diet by reading books on it by Rujuta Diwekar? Read more on this here and here. It should be noted that learning both vocal and instrumental music has benefits. 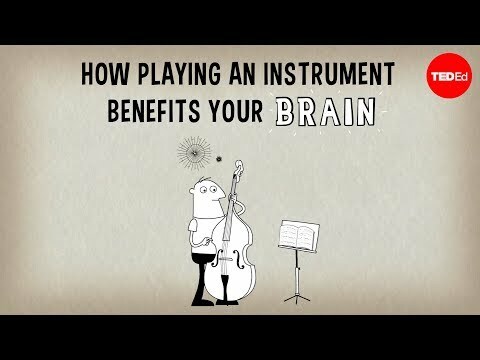 Take a few minutes of your time to watch this TED Talk on How Playing Instrument impacts your Brain. Is music an innate skill or can it be learnt? It is natural for parents to wonder about this question. Music is one of the few fields where one can find child prodigies. One finds child prodigies in a few fields like mathematics, music, sport, painting (art), chess etc. This makes people wonder if the music is one of those fields where you are either born with the skill or you do not have it in you to make it big. Let us examine this hypothesis based on latest research on this topic. There is no easy answer to the question. But research does indicate that prodigies are influenced to a good degree (perhaps around 50%) by their genetics and cognitive abilities that they are born with. Latest studies indicate that prodigies, across domains like mathematics, music and art, tend to have exceptional ‘working memory’, in common. Working memory is the cognitive system responsible for holding information temporarily for processing. Basis evidence of this nature, researchers have concluded that people who tend to be exceptional performers (top 1%) in education and various occupations are born and then made. In other words, a strong genetic predisposition seems to be a necessary even if not a sufficient condition. So, does this mean that if children are not born gifted in music, they would not grow up to be good at it? No! Firstly, we need to understand that the above research has been done on prodigies and exceptional performers. Just because a child is not a prodigy, it does not mean that they cannot go on to have a successful career in their chosen profession. Secondly, there is enough evidence to suggest that even though a child might be born with certain genetic gifts, the realization of the full potential needs a lot of environmental support. Therefore, for being an exceptionally gifted performer in music, it is not enough to be born with the talent, it is also important to have the right nurturing environment. Thirdly, there are numerous other benefits of learning music, as discussed above. Why should we deprive our children of these gifts even if they are not child prodigies like Shreya Ghosal or A R Rahman? There is no cognitive benefit of listening to music. But music education and active participation (either vocals or instrumental) have huge benefits. Prodigies may be born and then made. But that should not stop you from encouraging your child to learn music. We hope you liked our blog on music, music education and child development. As mentioned earlier, since this is a vast topic, we have restricted ourselves to covering only 3 questions. We will blog a lot more on this topic in future. How has music brought positive change in your child’s life? Please share your thoughts in the commenting section below.